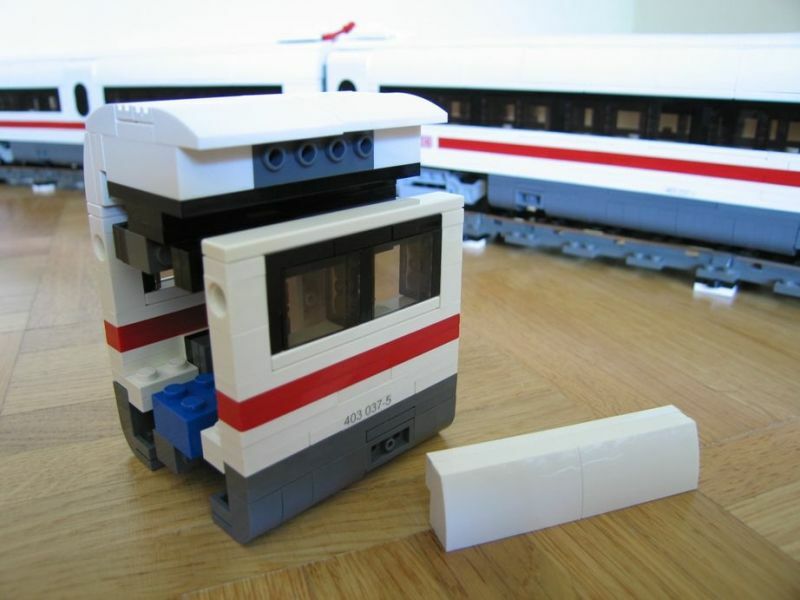 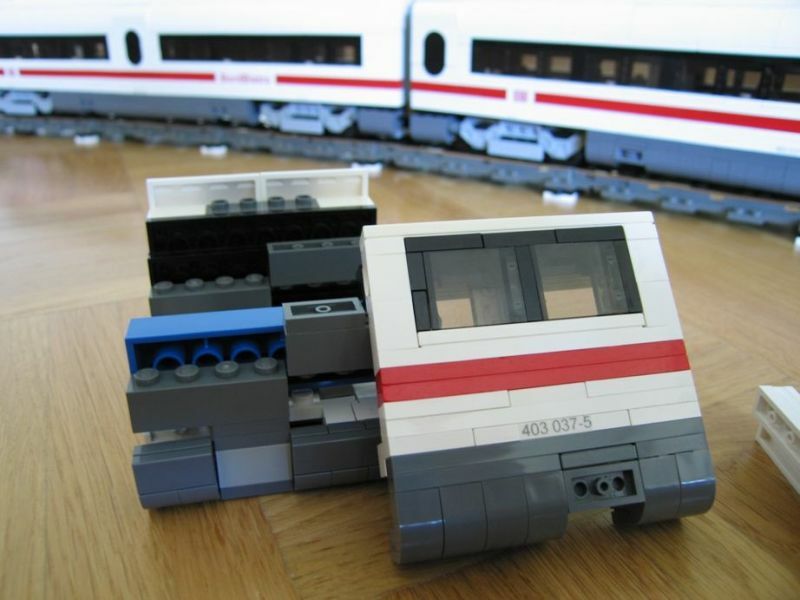 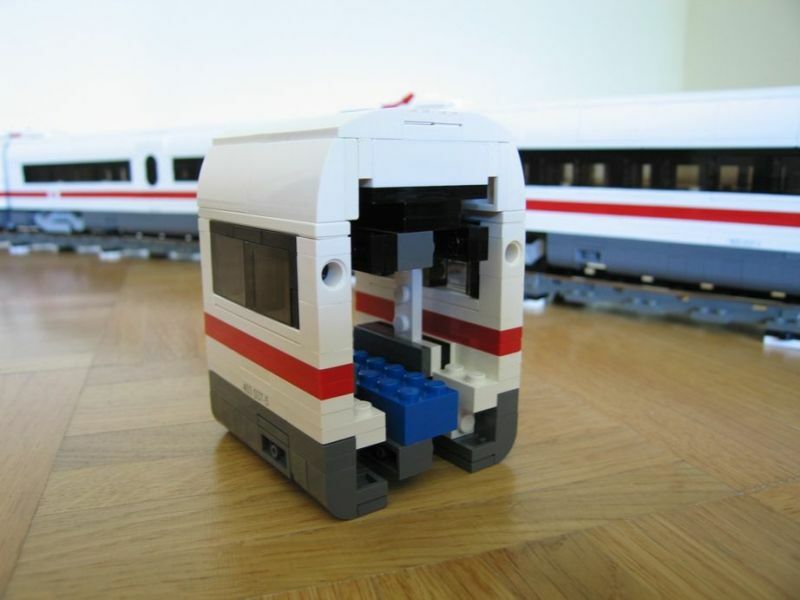 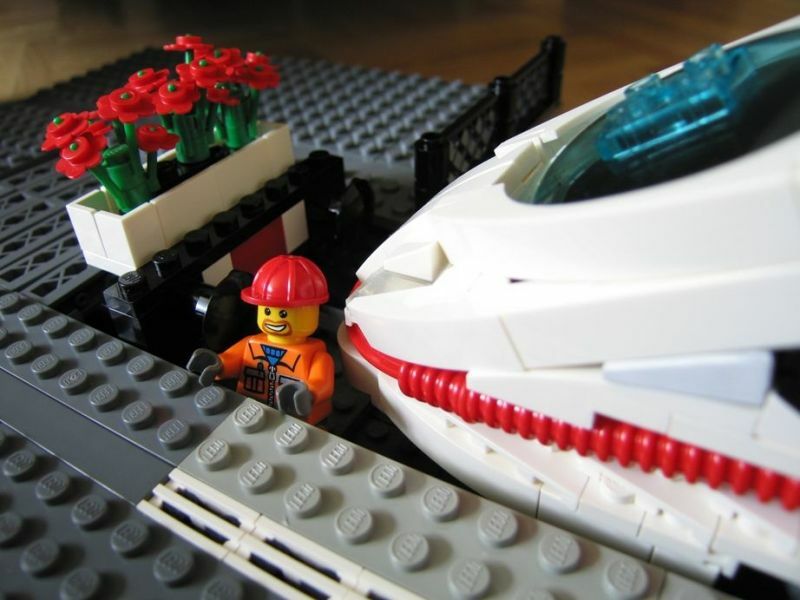 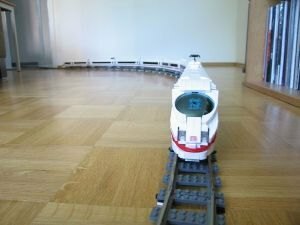 The idea of building this train as a LEGO model isn't new for me. But I never came up with a solution I was satisfied with. 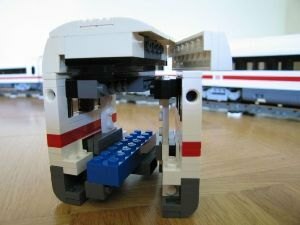 The nose of the train is a real challenge, but using 6x6 dishes as front windscreen and some of the new sloped elements coming in some LEGO car sets helped a lot to get the shape right. 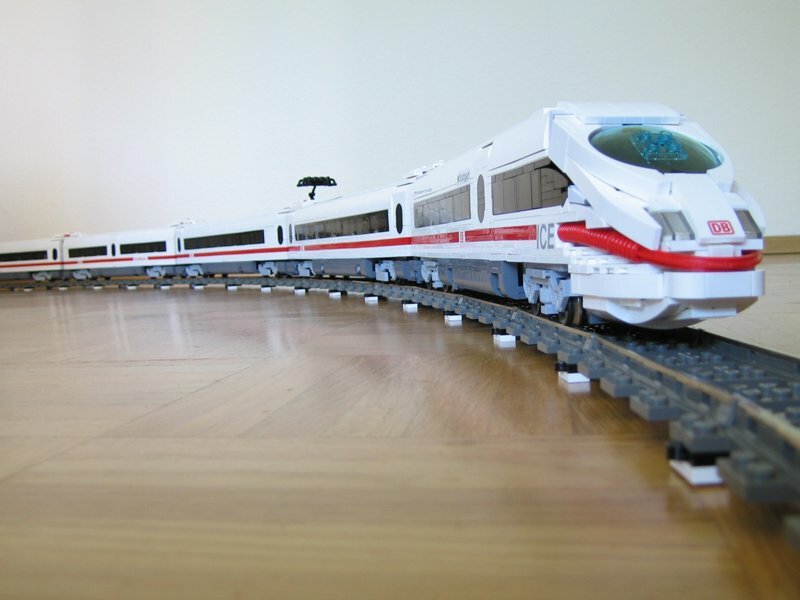 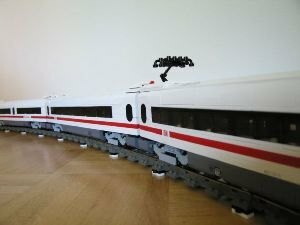 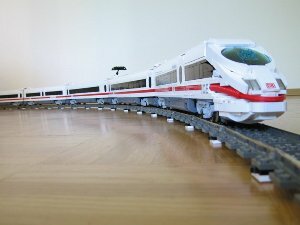 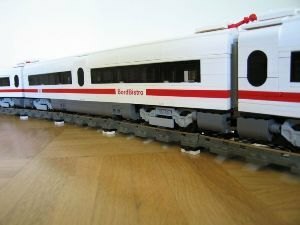 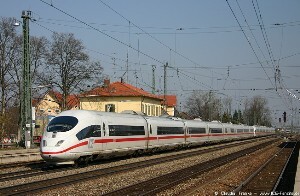 The ICE 3 is the latest version of the famous German high speed passenger trains. 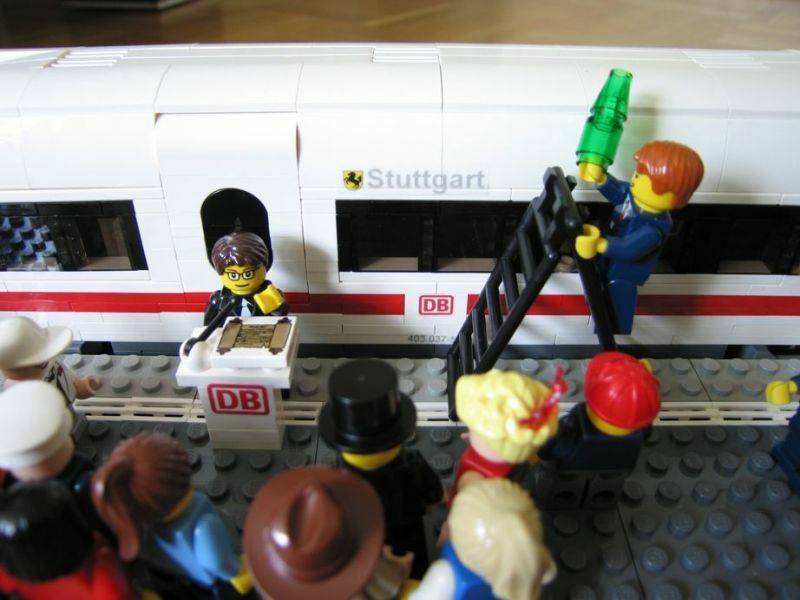 As the real one, my LEGO model comes in 8 units. 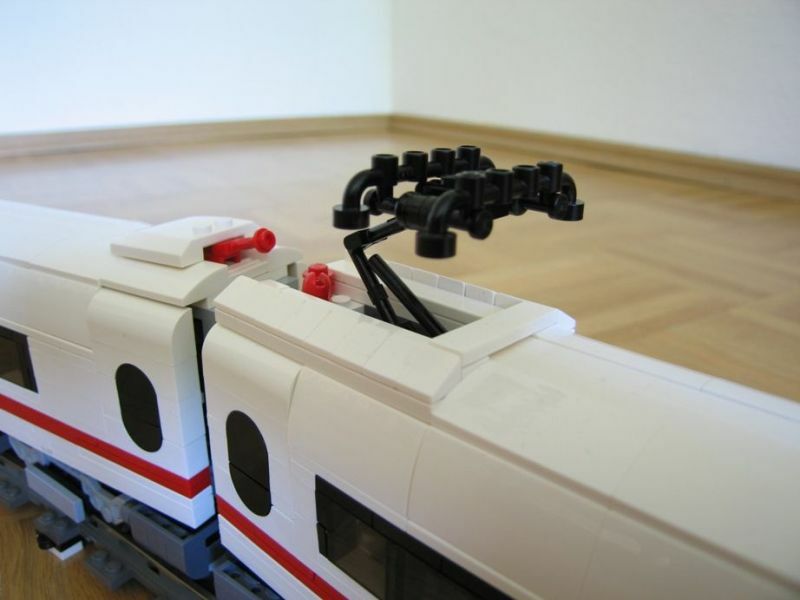 This type of train doesn't differ between locomotive and waggons, the electric motors are based underneath every second car. 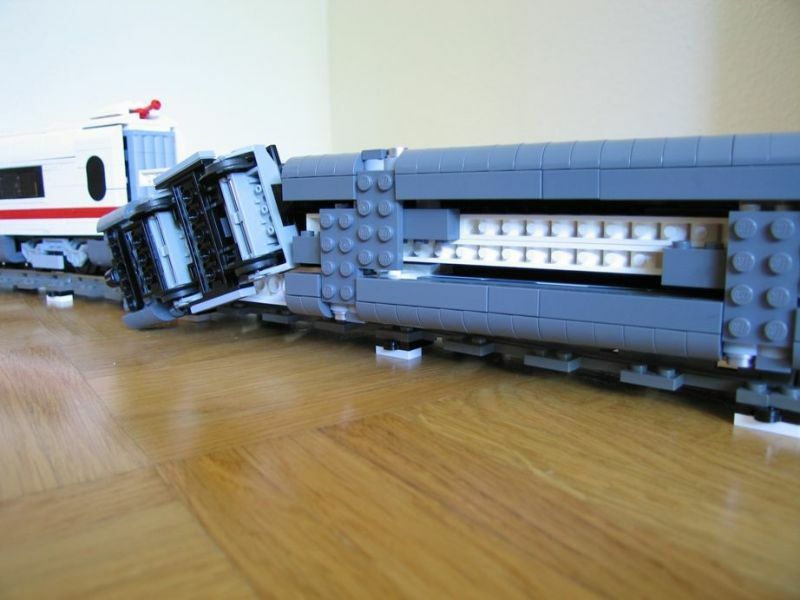 The end-waggons are 56 studs long, the middle-waggons are 52 studs long. 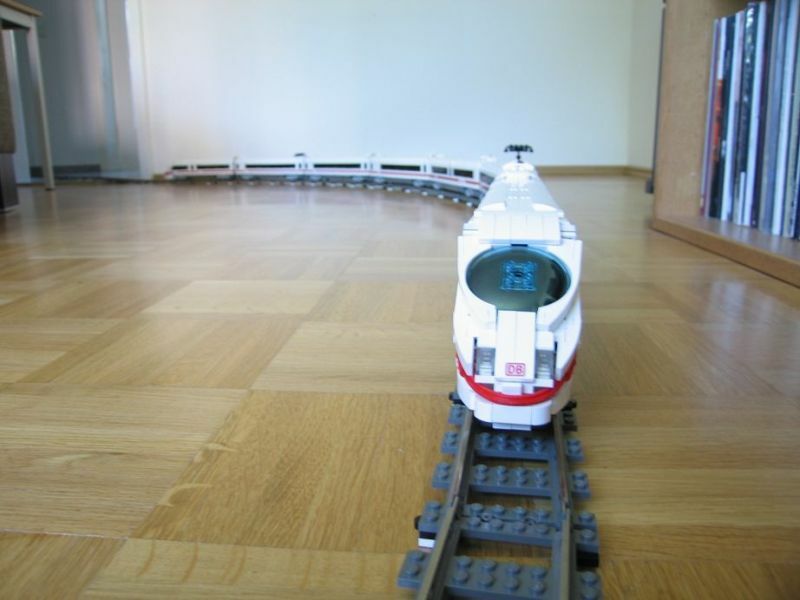 The whole train is about 3.5 m (~11.5 feet) long. 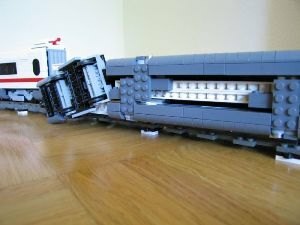 Due to the fancy SNOT use of the curved slopes the width of the train is a bit more then 7 studs, but less then 7.5 studs. 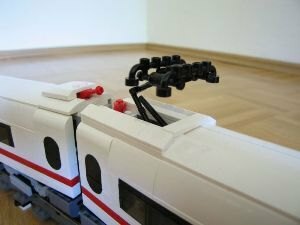 The 2nd and 7th unit have a pantograph. The units are coupled together using car coupling, no train magnets. 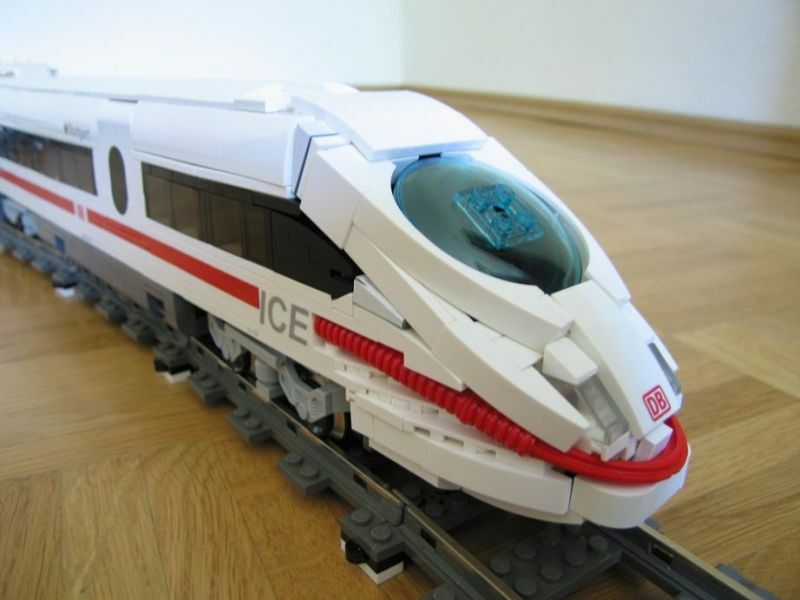 The characteristic ICE 3 nose – using LEGO to build this is quite a challenge. Countless "Slope, Curved 2 x 4 x 2/3 No Studs" (the element #61068 at www.bricklink.com) were used to build the roof. 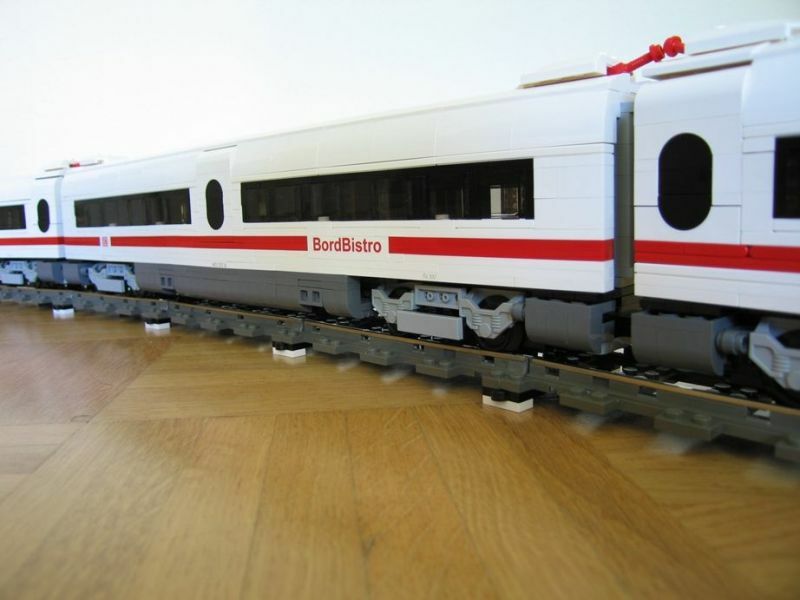 The onboard restaurant called "BordBistro". 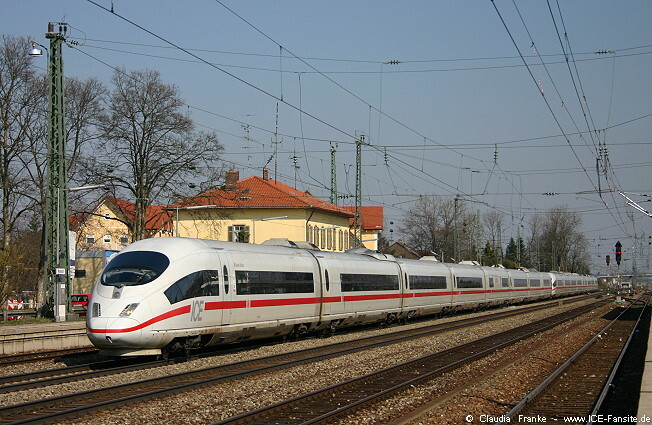 Most ICE trains carry a name of a German or European city. 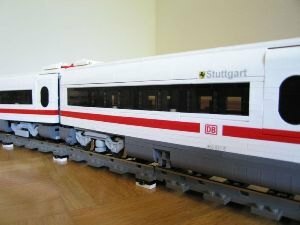 I choosed "Stuttgart" which is the next bigger city to where I live. 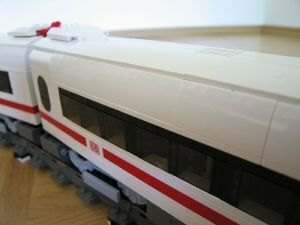 The train number is Tz 337 and each waggon carries it's own number, 403 037-5, 403 137-3, 403 237-1, 403 337-9, 403 837-8, 403 737-0, 403 637-2 and 403 537-4. This is what the train looks like underneath. A slice of the waggons shows how all 8 waggons are build. 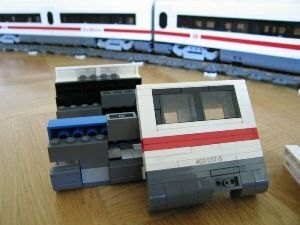 The roof structure is the heaviest part. A SNOT element (1x4 bricks with studs on the side) help to attach some of the sloped curved bricks/plates. The walls of the waggon are attached to the roof section and the center section. 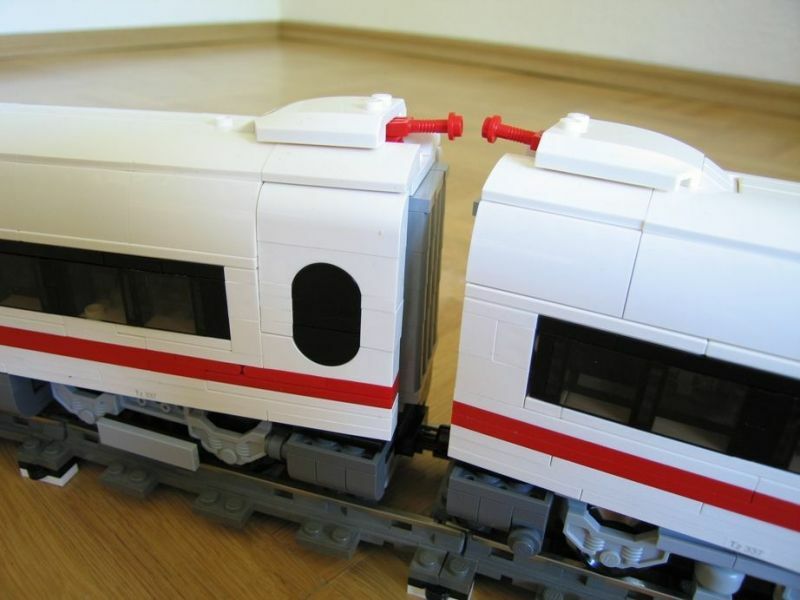 It's a nightmare to build this because you can not hold bricks inside the waggon. 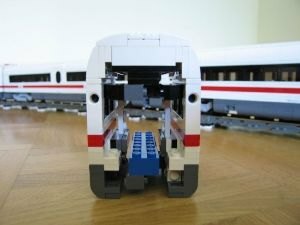 SNOT windows using James Mathis' design. 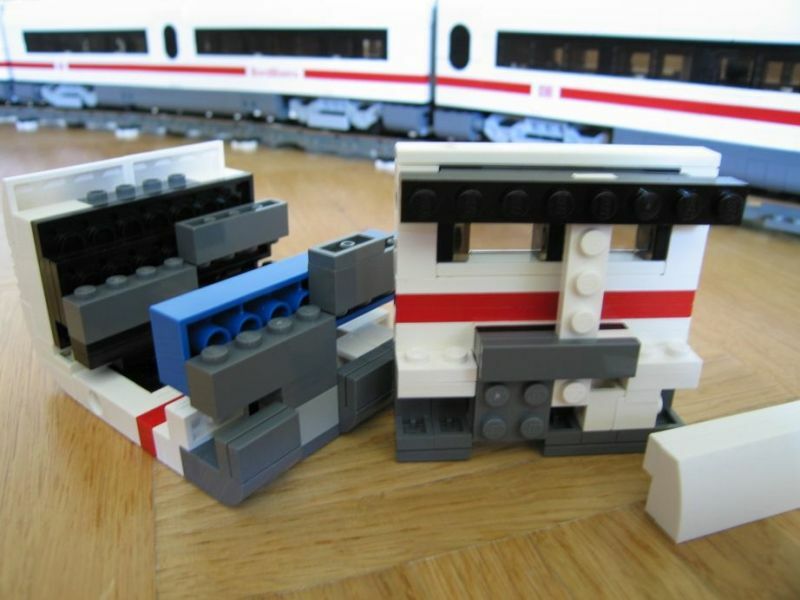 See how everything fits together. 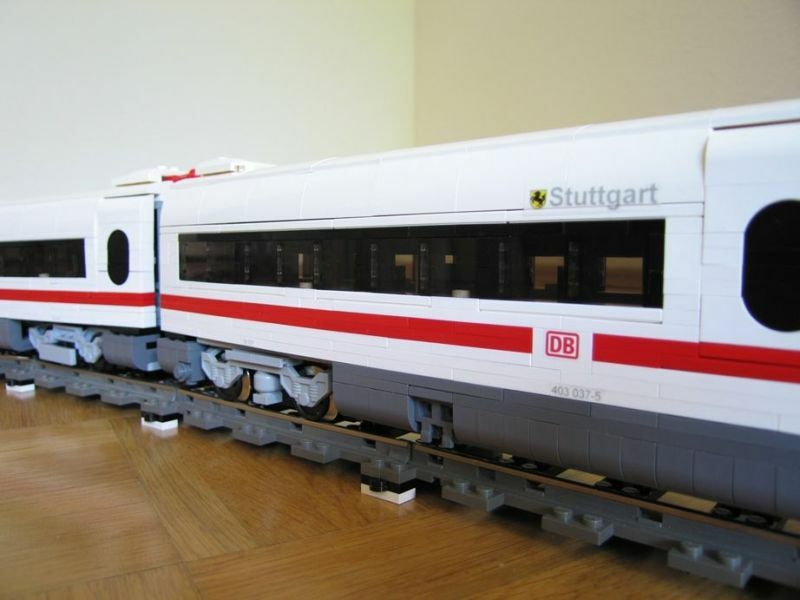 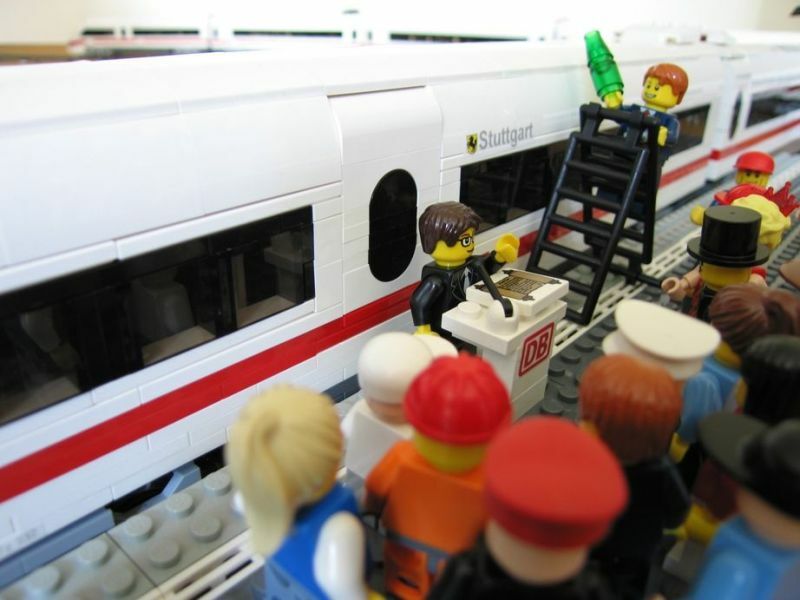 Baptism of a train: the Tz 337 is called "Stuttgart" now.